My name is Jenn, I live in the great state of Texas, and I’m a wife and mom to four growing boys (8,10,12, and 13) that are ALWAYS hungry. My husband has been in school full time while working full time since our oldest was two. During that time I’ve stayed home with our boys. In our single income household, making sure that every dollar stretches is important! If I go into the grocery store without a plan, especially if I’m hungry, I can come out with several hundred dollars in snacks and not a lot of food for me to actually make meals. I must plan our meals if I want to get the most out of our grocery budget, and to make sure that I’m coming home with wholesome food that will actually sustain our growing boys. My mom’s meal planning was on the fly. If she wanted to make this or that for the next three days, we’d go to the store for a handful of ingredients. When we returned home she’d often have to run back because we were missing an ingredient. As a mom of four boys, I don’t have time for that (no offense Mom). I knew I had to do something different with my family. I started meal planning eleven years ago when our oldest was two. Using pen and paper I would scour all of my cookbooks, write out my meal plan, and manually compile my list of ingredients. Planning on paper took at least three hours of my Sunday afternoons, which I had to do every two weeks. That works out to 72 hours throughout the year! And somehow I’d always forget at least one item, which meant multiple trips to the store and more time wasted! My husband encouraged me to find an app to automate what I was doing on paper. Over the years I had tried MANY apps, sites, and printables prior to my using Plan to Eat a little over one year ago. None of them had every aspect of meal planning, list making, and shopping that Plan to Eat does!! It’s a true blessing to people who plan their meals and I will never be able to go back to using anything else. On the account page in Plan to Eat you can see how many hours you’ve spent using the program. I looked over my stats and it only took me a little over 6 hours in the last YEAR to plan all of our meals (breakfast, lunches, and dinners), which is 12 times faster than what I used to do on paper!!! Seeing those numbers has shown me how much time I’ve saved over the course of the year since I’ve been using it. Automating my meal planning has been a no-brainer! Having my actual plan in hand means that I’m not questioning whether or not I need what I’m putting in my cart. I’m also not going to buy two and get home to realize that I already had three. When I get home I confidently know that I have a full two weeks of wholesome and healthy meals to feed my family! A meal plan doesn’t miraculously save you from those every-once-in-a-while pizza nights because you’re too tired to cook the meal you planned, but it really does save you money because you have actual food in the house to eat. This has been a 100 percent game changer for my family! What I love about shopping with Plan to Eat is that I can customize my list to the stores to where I actually shop. If I add a case of water to my shopping list, Plan to Eat will place that item in my Sam’s Club list because it knows that I always purchase our bottled water from Sam’s Club. We were also super excited when we discovered Plan to Eat on my phone because I have my checklist, and I can hide everything that I’ve already bought and it goes away. And I love that I can still see what’s for dinner tonight on the plan and I can look in the recipe box to double check while I’m at the store. I love that! For us, meal planning gets us to the dinner table gathered around the same meal. If you’re home that night and you’re not at a friend’s house or a something going on with school, we all eat one meal, at the same time. This has really been a big thing for us! Having everyone at the table is really important because we do talk and share about our day. Sometimes dinner is stressful with four boys who forget their table manners, and I have to remind them not to use potty talk at the table, but still we’re all there together and that is what matters most to me. That wouldn’t happen if we didn’t plan for it. If you’ve been inspired by Jenn’s story and you would like to try meal planning with Plan to Eat for yourself, click here to give it a try. It’s completely free for 30 days, no credit card required, and there’s no obligation (or pressure) to buy. 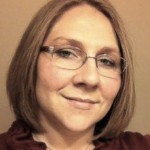 By using Jenn’s referral link, you will be supporting Jenn through our Affiliate program. What’s your Plan to Eat story? Do you save money by meal planning? Do you eat together as a family more often? Do you eat healthier food? Whatever your story, I’d love to hear about it! We’re exploring why meal planning matters and I would like to share your story with other Plan to Eat users. As a thank you gift I’ll send you our world-famous canvas tote bag! 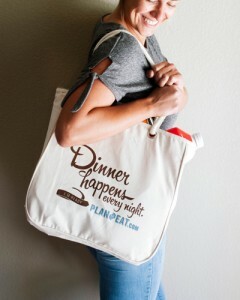 These canvas totes are custom made for Plan to Eat with organic cotton, metal grommets, and reinforced rope handles. They are burly enough to handle the heaviest of loads, and the soft canvas sides will keep you stylin’ as you stroll through the farmer’s market.